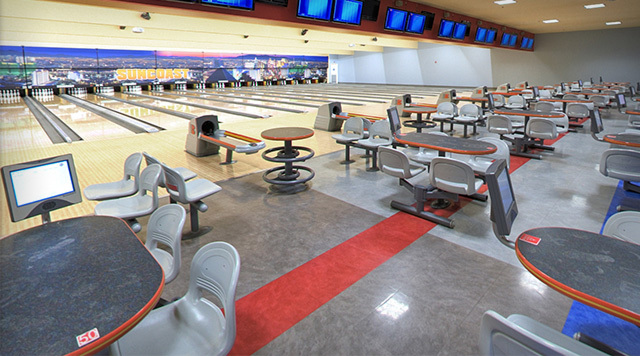 A three-time winner in the Las Vegas Review-Journal’s “Best of Las Vegas” readers poll, the Suncoast’s 64-lane Brunswick-equipped center is one of the Valley’s favorite bowling destinations. We pride ourselves on offering something for everyone. Whether you’re looking to bowl a few quick frames, host a team-building exercise for your company, or join a competitive league, the Suncoast is your neighborhood bowling center. We offer extensive Junior and Senior Bowling Programs as well as exceptional men’s, women’s and mixed leagues. And be sure to join us on Friday & Saturday nights after league sessions for “COSMIC BOWLING”, a unique experience that features the lights, sounds and atmosphere of a discotheque. It’s an experience you won’t want to miss! Come bowl with the Pros for our annual Pro-Am event June 9, 2019. Squad times will be 12:30pm and 3:30pm. Special room rates are available with code ASRPBA9. More information to follow soon! Daytime open play rate - $2.75 per game. Hourly rate - Weekdays $15.00 per hour. Weekend hourly rate - Friday-Saturday–Sunday $20.00 per hour. League bowlers practice hourly rate - $12.00 per hour. Military discount - $2.00 per game. Shoe Rental - $4.00 per person. Holidays from 9:00am-10:00pm - $3.75 per game. Friendly and knowledgeable support staff, and much, much more!! !